HomeUncategorizedTHRASH METAL MADNESS: FIRST ROUND BRACKETS!!! It’s been a long time since the Thrash Metal Madness competition has been discussed here on Global Thrash Assault, mainly because it took longer to get bands to participate than originally anticipated. However all slots have been filled and voting is finally upon us! 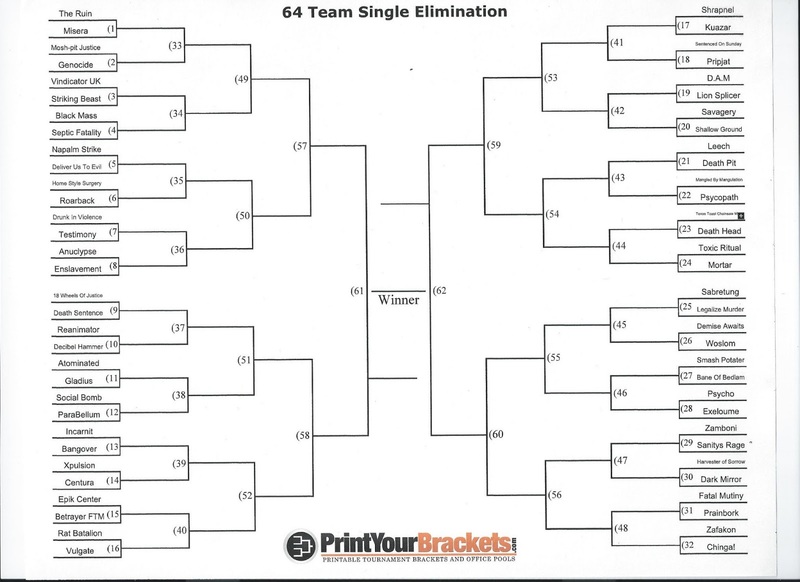 Before you can vote however you need to know what the brackets look like right? Right. Well, there’s been a slight change. I originally stated I was going to make a video of the drawing however I decided against that because well, it would have put you to sleep. I did however hold a drawing and all names were pulled out of a hat at random. For anyone thinking “that’s not fair” I encourage you to think for a moment before saying anything. I honestly don’t care who wins. There are a lot of quality bands participating in this and if your band is the one that manages to gain the most votes thereby winning a spot on Wreck Your Neck Volume 2 then you deserve it. Period. Please keep in mind this is nothing more then a friendly way to discover new bands and grow your fan base. Voting will begin on Sunday March 17th. Each round will last one week. The band with the most votes at the end of each round will advance. This will continue for several weeks until only one band remains. That band will be featured on Wreck Your Neck Volume 2. Bands can promote the competition as much as they want in any way they want in order to gain the most votes and move onto the next round. I only ask that there is no trash talking between bands. I can’t monitor the internet but we’re all adults here, let’s act like it. In the unlikely even of a tie the two parties will have another 24 hours to gain the most votes. This will continue until there is a winner. Again this is highly unlikely. Be sure to check all the bands out and don’t forget to check out the tournament layout below! 10 Comments on THRASH METAL MADNESS: FIRST ROUND BRACKETS!!! Lost Society “Fast Loud Death” the best thrash album of 2013? check out Lost Society on my blogg. and Exeloume win. Thanks for coming folks! How can a band partecipate to thiss?? Tell me pliz! The Donner Party are MANDATORY!! YOUR DAILY DOSE OF THRASH – 5/2/2014 – D.A.M.